And I felt the givin' gettin' me up off the wall"
Every now and again someone rises into your consciousness to remind you stuff you already know. Stuff that you should remember, but the struggle of life gets in the way, and you temporarily forget as you focus on the struggle instead of the solution, and all that you should be grateful for. By showing me to give is priceless"
You know 'cause it isn't every day that you get to give"
Couldn't have said it better myself - and you really don't want to hear me sing it!!! 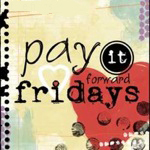 So go out into the world and Pay it Forward. Hi Kelly, Stop by my blog and pick up your award! Wow, I am so touched by the thoughtful words you wrote. Thank you, Paula Devi.